Napoleon GL28P 28 Inch Reversible Vented Propane Gas Log Set. Most would say that you can’t have a real wood fire without all of that time and effort. Napoleon has proven that untrue with their GL28 Reversible Gas Log Set. You can have the look and feel of a real wood fire with virtually zero maintenance. The reversible logs give you the look of split logs or natural tree bark. Imagine changing the look of your entire room just by flipping the logs to show one side or the other with the changing seasons! How convenient is it that you can flip a switch and immediately have a roaring fire. Give your space the ambiance it deserves with a large fire on command. The high BTU’s warm the GL28’s logs, which absorb the heat, reflecting it out into your room. The ingenious burner system spreads the flame to create the most realistic fire experience. The ceramic fiber logs hold the heat and will continue to disperse it into the room, leaving you with radiant warmth even after the fire is gone. Less expensive than a gas fireplace insert, the GL28 Gas Log Set is a great way to quickly update your existing wood fireplace without losing the look or the charm. With the flip of a switch you can have the instant heat and ambiance of a wood fire without the work or mess. When done with the fire, flip the switch again and the fire is off. Life is unpredictable, but that doesn’t stop a Napoleon GL28 Gas Log Set. If the power goes out there is no need to worry. You will be safe and warm with the battery operated ignition. The GL28 has the SAFEGUARD system built in as well. Just another reason the GL28 is more convenient than a real wood fire. FEATURES: Up to 80,000 BTUs; Wrought iron grate; Charcoal lumps, charcoal embers & glowing embers; Glass to cover the bottom pan; Reversible PHAZER logs – two log sets in one; Optional remote kits (two); All components packaged in one box; CSA approved; Mobile home approved. 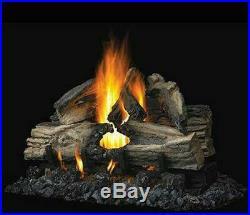 28 Inch reversible vented 80,000 BTU gas log set for propane gas. 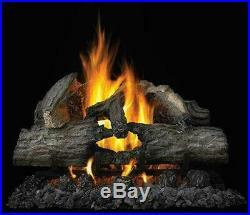 Can be configured for an authentic looking split-wood fire or a natural looking tree bark appearance or combination. CSA and mobile home approved. Includes wrought iron grate, charcoal lumps, charoal embers & glow embers. 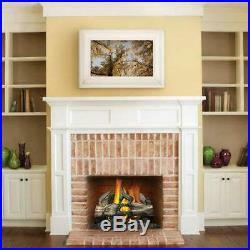 Minimum Size Fireplace Opening: 20″ H x 29″ W x 14 D. Item(s) must be in new condition, with all original accessories and in the original packaging. We are happy to assist you! WARNING: This product can expose you to chemicals including LEAD AND LEAD COMPOUNDS, which are known to the State of California to cause cancer and birth defects or other reproductive harm. The item “Napoleon GL28P 28 Inch Reversible Vented Propane Gas Log Set” is in sale since Thursday, January 4, 2018. This item is in the category “Home & Garden\Home Improvement\Heating, Cooling & Air\Fireplaces & Stoves\Decorative Logs, Stone & Glass”. The seller is “spotixinc” and is located in North Liberty, Iowa. This item can be shipped to United States.